In Spurs most recent setback, dropping points away to Hull City, two players that came in for fairly heavy criticism were Nabil Bentaleb and Roberto Soldado. One, Bentaleb, is the nineteen year old that has been handed a wealth of playing time under Sherwood in midfield over more experienced, senior players and the other is the high priced forward who has failed to impress in his start to life at White Hart Lane. Michael Dawson also came in for criticism, specifically in reference to the goal allowed by Spurs, but as was touched on earlier here, the exploitation of Dawson’s lack of pace has more to do with the system he plays in, not Dawson. Bentaleb has become the most controversial figure under Sherwood’s reign as first team manager as he has been preferred to Etienne Capoue, among others, in Spurs midfield. Some of this has to do with Sherwood’s apparent refusal, based on his quoted philosophy, of not feeling the need to field a player in midfield who specializes in playing the holding midfield role. He prefers more well rounded midfield players and does not see the need to field an out and out defensive minded player in midfield, whether he is playing 4-4-2 or with a five man midfield. That refusal has continued to expose the shortcomings of Bentaleb, Paulinho and Dembele, who are all fine players and offer plenty in possession, but not one of them has mastered the positional discipline to be able to protect the centerbacks and influence the game in possession. Nor has any central pairing been able to develop an understanding to play the “double pivot” where in one player goes forward, and the other stays, the pairings have always been somewhere in between. Criticism then of Bentaleb needs to be separated clearly into two arguments, the first falls on Sherwood in why he is playing him, why he doesn’t want to field a holding mid and why he frequently feels comfortable with two center mids and not three. The second argument needs to focus on what Bentaleb is doing when he plays, good and bad, from which we can try to see what central role he may fit in best. The biggest talking point with Bentaleb has been his passing, his supporters point to his high amount of passes and pass completion percentage, sometimes approaching 100 passes a match at rate exceeding 90%. His detractors have pointed to the fact most of these passes are short, square passes in uncontested areas of the midfield. What is this really contributing to the team? In the match against Palace, they were happy to let him have plenty of possession and sat off him letting him hit all the short passes he wanted and they weren’t going to do Palace any harm. 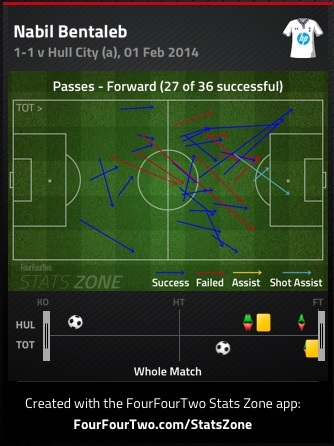 But in the match against Hull, Bentaleb played “only” 69 passes and completed 58, an 84% completion percentage. He found himself under slightly more pressure and was not allowed such easy possession as he has in the past. Not allowed to play these simple passes so easily, Bentaleb looked to move possession forward fairly often with his passing. Of those 69 passes, 36 were forward passes, just fourteen were square. And he completed 15 of 21 passes in the final third. In the Palace match he played 44 forward passes out of 107 and 34 were square. He looked to pass forward 41% of the time against Palace and 52% of the time against Hull. In the Palace match none of his 107 passes created a chance, against Hull he created two chances from open play. 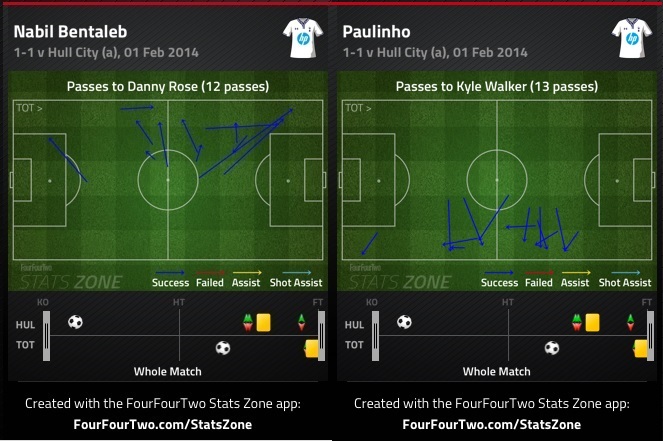 The two most frequent pass combinations in the Hull match were Paulinho to Walker and Bentaleb to Rose. However, all of Paulinho’s passes to Walker where in the middle third and square(relatively), Bentaleb however found his sided fullback just as often but in more advanced positions with forward passes into the final third. Defensively he made seven ball recoveries, most among Spurs other three midfield players and was the only midfielder to intercept any passes, making three. Not a stellar defensive performance but Hull mostly looked to bypass the midfield as they looked to break forward with long balls. He did manage to get back defensively well enough, the screen shot below shows one instance in which, for once, a Spurs midfield player is able to get back to help the centerbacks deal with opposition forward players. We can hope to see this more often in one of two ways, Bentaleb learns to position himself deeper with his back to goal on a more regular basis or…Sherwood plays one of his midfielders that already does this. There is optimism for Bentaleb, he’s comfortable on the ball and shows a willingness to put in defensive work and there’s signs he is willing and able to play advanced passes and not 90 five yard passes every time out. But does this experiment warrant him being played over a host of midfield players that are at the present time better overall than he is? Spurs have quite a bit of work to do to reach fourth spot and/or grab the Europa League trophy and it’s understandable Sherwood likes the kid, but he is a kid, a loan option for him would have seemed to be the much better choice as we’ve seen Steven Caulker, Andros Townsend and others go out on loan and comeback to Spurs ready for a starting role. Otherwise, he is best served to only be starting in three man midfields. His ability to pitch in defensively and recycle possession at a high and relatively safe rate and at least a willingness to pass forward and occasionally pop up with a shot makes him the perfect in between midfielder. In between meaning he has a dedicated defensive mid operating behind him(Sandro or Capoue) and an attack minded mid operating alongside him in the defensive phase and free to roam in possession(the one and only, Eriksen). Bentaleb would neither need to be a creator or destroyer, his task would be to assist the midfield specialists around him and bridge the gaps between the other two roles. Oh Roberto, what an interesting season it has been for Soldado in his first campaign with Tottenham. One goal from open play all season in the league has led many to slowly question more and more, if Spurs have made a massive mistake in laying out such a hefty sum of money for what is supposed to be a player in his prime and the scorer of many great goals. He was not a signing like Eriksen, Lamela or Paulinho bought with the understanding that however good they would be in 2013-14, the best will come later, no, Soldado was brought in to score goals in this campaign and he largely, has not. Since Sherwood has arrived he has been more influential when partnered with Adebayor but it’s been in setting up Adebayor for the goals and not getting them himself. There is of course not much wrong with one striker teeing up his strike partner for a glut of goals in a short period of time but Adebayor has been making Soldado look redundant as he offers a great deal of help to Spurs in both the defensive and build up phases of play. And when Adebayor played as a lone striker against Swansea he popped up for a brace. Leaving us to question where Soldado fits in if he isn’t scoring? If Tottenham plays with a single striker surely at this point Adebayor is preferred to Soldado and if they play with two and Soldado looks redundant, it doesn’t really leave Sherwood with a reason to play two then, does it? Spurs looked the most composed defensively and in possession under Sherwood when they played a 4-1-4-1 defensive block that transitioned into a 4-4-1-1 shape with Eriksen in behind Adebayor free to roam wherever he found space and still having defensive cover across the pitch. If that becomes Sherwood’s preferred system, Soldado is unneeded. But, he will be needed this season one way or another. Either Adebayor will pick up a knock, need rest or Spurs will be chasing a goal and make the call for Soldado. Or Sherwood continues to stubbornly field a 4-4-2. Is there any hope left for him, beyond youtube videos of his glamorous goal scoring exploits in Spain that suggests, yes, Soldado can score goals and yes, they are brilliant? Against Hull he once again showed himself to be useful in receiving possession up the pitch, taking in a pass inside the box seven times, while also receiving a pass inside Spurs own half just as much, eight times. That does show a willingness to either drop deep to get on the ball or get back and help with defensive duties. He worked the right side of the pitch well, allowing Adebayor to do an equally effective job operating on the left. He completed 30 of 37 passes, an 81% completion rate and created two chances, including his excellent pass to Adebayor that was vollied on target. He also had four shots on goal, all from inside the area, where he scored all of his goal for Valencia last season. One of his shots was a gloriously over hit shot from point blank range and he also hesitated to shoot when he had a clear cut chance to do so from a spot inside the area. These attempts or not taken attempts do not look like the Soldado we were expecting, it is possible to suggest his confidence has been shaken because the goal drought is in his head. Sherwood made a point of saying that is not the case. And maybe it isn’t, but does anyone think Sherwood would announce to the media, “Yea, he’s a bit of a mess at the moment isn’t he? Clearly the pressure of being a 26 million pound forward with one goal from open play is weighing on him. Yea, it’s quite bad at the moment, eh?” Of course not. If he had banged in a brace, sure then Tim can come out and say he was frustrated, yes, but the goals have come and now they will flow as he has his confidence back. It’s not a dissimilar situation to that of Fernando Torres at Chelsea, he has had dry spells that have been well documented at Chelsea but during those spells he’s been a useful player for Chelsea in the build up phase and setting up others for chances on goal but he too suffered from glaring missed chances(worse than any of Soldado’s mind you) and was clearly visibly distraught. Torres’ goal scoring comes and goes for Chelsea, he did heat up a bit recently for them, but he does contribute in other areas keeping himself from being utterly useless as some forwards become when they are not scoring. Looking to Torres as a glimmer of hope for Soldado is not overly comforting, especially considering Torres has his past ability of scoring freely in the EPL with Liverpool to look to for support, where as Soldado has no history here. It’s not much and it is worrying times for Spurs’ big money signing but it could still be as simple as one vollied shot hitting the back of net to spring the Spaniard back into form.